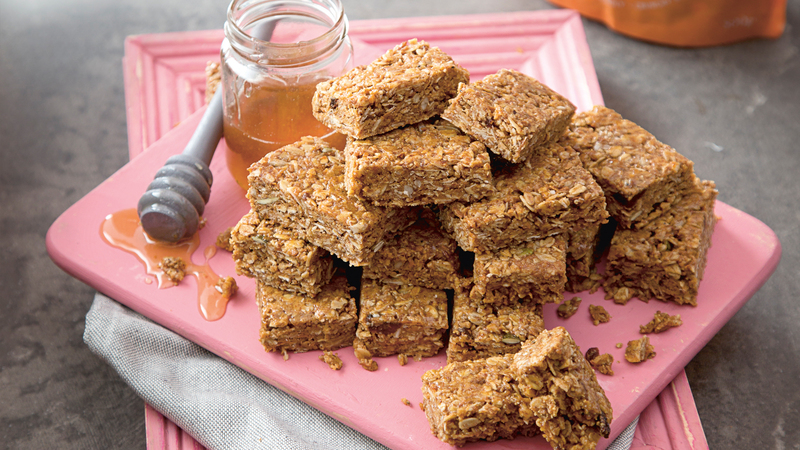 Ella Woodward shares her granola bars recipe using her Deliciously Ella Bircher original granola from her new range of plant-based products exclusive to SuperValu. 1. Line a baking tray with non-stick baking paper. 2. Start by toasting the coconut in a hot oven just until it becomes lightly coloured and smells delicious. When toasted, put the coconut in a bowl with the granola, almond butter and salt and mix together. 3. Bring the honey or rice syrup to the boil, then pour it over the granola mix and stir everything together until well combined. Tip out onto the lined baking tray and rmly push the mixture down. 4. Leave to set in the fridge for a couple of hours, then cut into bars and enjoy. These almond butter granola bars are perfect for snacks at work with the bonus that they are healthier than most snacks and will fill you up between meals.